When a fire starts inside your home, every second counts. Three simple words can help save your life: close the door. It's something firefighters have known for years but now the nation's top fire safety group is pushing new guidelines to spread the message. It's not the flames that are most likely to harm you in a fire, it's the smoke and toxic gases. Research shows sleeping with your bedroom door closed can help prevent you from becoming overcome with smoke. The simple act, along with having working smoke detectors inside and outside of the room, can give you valuable minutes to escape through a window or pick up the phone and call 911. A closed bedroom door may have saved a six-year-old girl's life when a fire started in the kitchen of her Miami apartment. Firefighters said it gave them time to bust open her bedroom window and rescue the girl who was passed out on her bed. "At that point when I picked her up, she started moaning which was a good thing," said Miami-Dade firefighter David Arrencibia. "I'm grateful, had we taken another three or four minutes the situation would have been different." RAW VIDEO: Underwriters Laboratories research demonstration to show the difference a closed door can make. An apartment door that was left open did just the opposite when a fire broke out at St. Andrews Towers in Coral Springs back in 2008. Fire inspectors said the door to an apartment where a fire started was left open, causing the toxic smoke to spread throughout the senior center. A total of 18 people were hospitalized for smoke inhalation and hundreds of others were evacuated. "It's something so frustrating, close the door. It can save your life," said Coral Springs Fire Inspector Charlie Bass. The NBC 6 Investigators experienced the life-saving act first hand. They went along with firefighters with Broward Sheriff's Fire Rescue team as they set a room on fire inside a Fort Lauderdale Training Center. Once the fire was set, crews shut the door to simulate how effective the barrier can be to keep smoke and toxic gases out of a room. 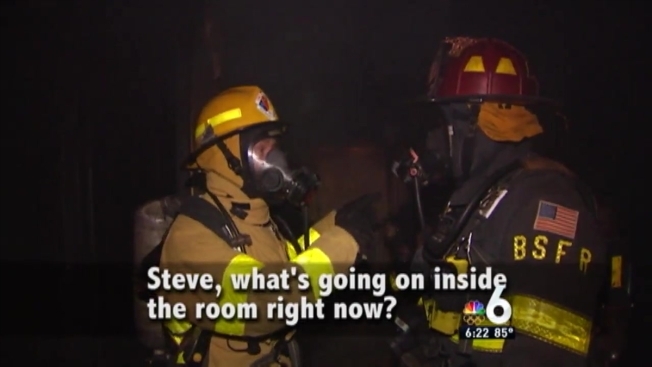 Firefighters used a thermal imagining camera to show the NBC 6 Investigators how just seconds after the fire started, the flame-filled room grew to 700 degrees. In the room where they were standing, on the other side of the door, the temperature was only 87 degrees. The room was hot but safe. The door provided a good barrier between the firefighters and the flames and smoke. Then two minutes into the fire crews opened the door, allowing the smoke to pour into the space. Within seconds, the room increased to 900 degrees. "It can be the difference between life and death," said Broward Sheriff Fire Rescue Captain Steve Bertuccio. "By the time you realize the fire they're disoriented by smoke and might not even realize how to get out of the room." Researchers with Underwriters Laboratories also showed just how quickly the toxic smoke can travel. They set fire inside a training facility. That demonstration showed within just a minute and a half, smoke traveled to a second floor bedroom that had an open door. The bedroom with the closed door prevented smoke from filling the room by several minutes. "A closed door may slow the spread of smoke, heat and fire. Install smoke alarms in every sleeping room and outside each separate sleeping area. For the best protection, make sure all smoke alarms are interconnected." The fire safety group changed its messaging just months after NBC 6's sister station in Dallas first reported the safety benefits of sleeping with your bedroom door shut and the lack of promotion the simple act was getting by national safety groups. To watch that investigation, click here. Firefighters said some parents are afraid to shut their child's door at night because they want to hear them if there's an emergency. They recommend using baby and child monitors to keep an eye on your child. And, if your child is afraid to have the door shut, leave it cracked open and fully close the door once they have fallen asleep.